This isn’t the first time we’ve heard of this feature. In fact, Instant Tethering was a feature that began rolling out about three weeks ago on Pixel devices. The way this feature works is the following: Bluetooth is used to talk between two of your Google devices. If a Nexus or Pixel tablet finds itself without a Wi-Fi connection, it can ask your connected Nexus or Pixel smartphone to flick on its mobile hotspot; all is done with a single tap, and there is no need to take out your smartphone. Google’s Omri Amarilio went to the Pixel User community on Google’s product forums to outline how the feature works and in what context you’d be able to use it. He ends the post with a question for everyone reading about Instant Tethering: “Where did you last wish you had internet on your tablet? 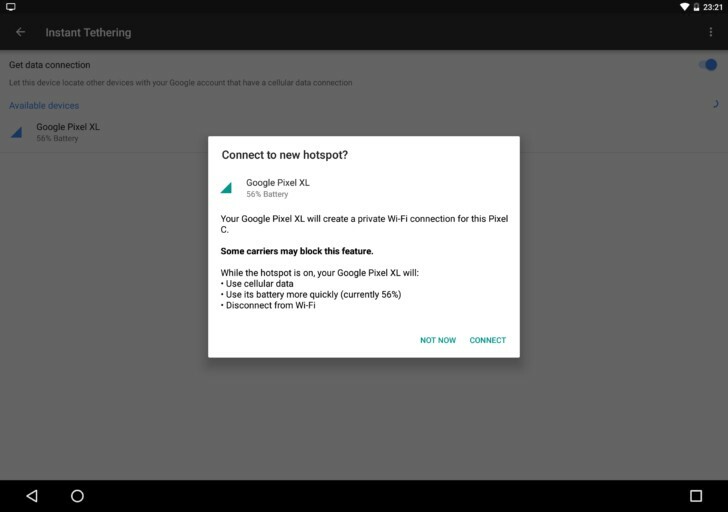 Google’s official help site lists all “host” devices that can automatically share their mobile connection: Google Pixel, Google Pixel XL, Nexus 6, Nexus 5X, and Nexus 6P running Android 7.1.1 and up. These are the devices than can automatically use shared data connections: Google Pixel, Pixel XL, Nexus 6, Nexus 6P, Pixel C, and Nexus 9 running Android 6.0 and up. Some carriers limit tethering use or don’t even offer it without an additional charge. Just make sure you check with your carrier to see if your plan allows you to tether without incurring additional fees. If you’re ready to activate it, head to your smart devices and go to Settings > Google > Instant Tethering. Then, enable the option to either “Provide data connection” or “Get data connection”. Sony has been doing this for years (and Apple copied that) but only between Xperia devices, so I hope this future become available across all Android and PCs.